The best scenario is a 3-points back up, where a customer backs up on premises with his own brick, paired to a provider's brick where it's replicated, and from here, archived on an S3 bucket. Less appropriate is a small business, due to the costs involved. But for these cases, providers come in help, and Rubrik created a specific program with a pay per use plan. Fast mount point for virtual machines. Role based access control for specific Backups. 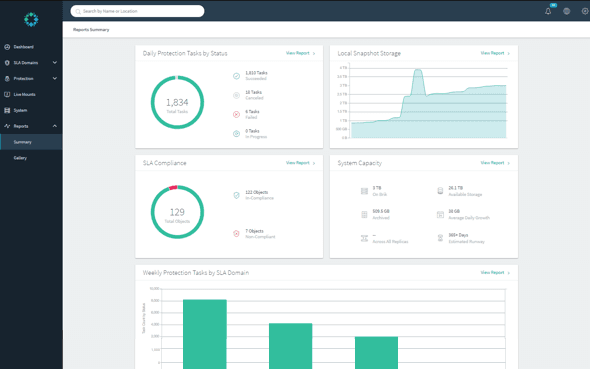 The issues are usually resolved within 24 hours, and most either via e-mail and/or remote session initiated by Rubrik support to the appliances.There is minimal involvement required by my stuff. I've used Barracuda Backup for years and it has been a good product. We need at rest encryption and their offerings with that feature were too expensive for us. I did a POC with Rubrik and was sold on the Rubrik almost immediately. I thought Barracuda was easy but Rubrik is so much simpler. It's positive because we no longer have to worry about if backups are working in intervals or if there's snapshots throughout the day. Rubrik does it all.